This is a Poster. It was designed by Dan Friedman and from the office of Anspach Grossman Portugal and made for (as the client) Citibank. It is dated 1975 and we acquired it in 1997. Its medium is offset lithograph on white wove paper. It is a part of the Drawings, Prints, and Graphic Design department. This object was donated by Ken Friedman and catalogued by Carey Gibbons. It is credited Gift of Ken Friedman. 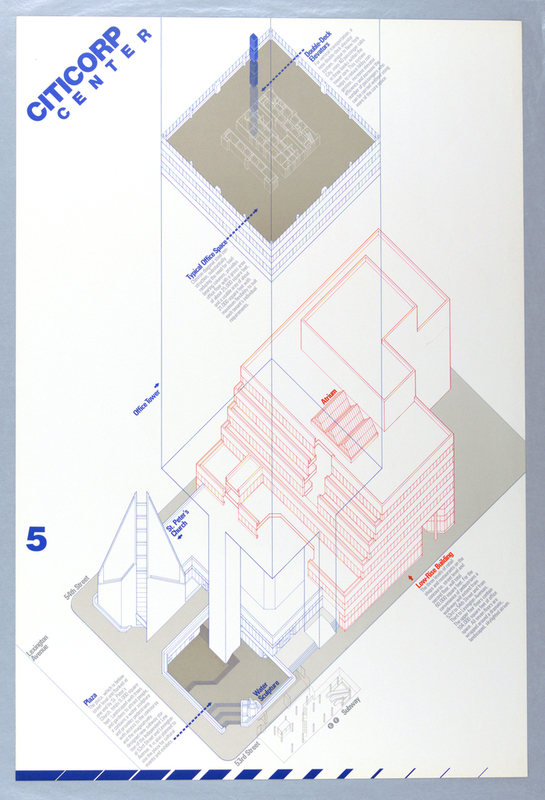 Printed in blue, upper center, to the right of drawing: Double-Deck / Elevators; in grey, directly below: For vertical transportation, a / new double-deck elevator / system, unique to New York / City, uses 40 passenger cabs / in three banks within the / tower core. This system / helps to reduce lobby con- / gestion, increase elevator / efficiency and increase the / number of passengers who / can be carried withour using / more of the core space. Printed in blue, upper center, to the left of drawing: Typical Office Space; in grey, directly below: Chevron diagonal steel con- / struction, substantially / reducing the need for load - / bearing columns, provides / office floor with a gross area / of almost 25,000 square feet, / and a usable area of about / 21,000 square feet with / maximum flexibility to suit / each tenant's individual / requirements. Printed in orange, lower right: Low-Rise Building; in grey, directly below: The three levels of retail / shops and restaurants on the / concourse, street level and / second floor, will total / 60,000 square feet. For the / convience of pedestrians a / walkway will extend from / 53rd to 54th Street and from / Third to Lexington Avenues. / The upper four floors contain / 104,000 square feet of office / space. All seven floors are / wrapped around a dramatic / landscaped, skylighted atrium. Printed in blue, lower left: Plaza; in grey, directly below: The Plaza, which is below / street level and flanked at / one end by St.Peter's / Church, totals 9,000 square / feet. Landscaped with trees / and gardens to attract peoople, it contains a water sculpture / and provides pedestrians / with access to the concourse / and the imaginatively / designed new subway sta- / tion of the Independent line / at 53rd Street and Lexington Avenue. It is also planned to / use the plaza for cultural / events and exhibits. Printed in blue throughout design to indicate particular sections of the drawing: Office Tower / St. Peter's Church / Water Sculpture. Printed in orange: Atrium. Printed in grey: Lexington Avenue / 53rd Street / 54th Street / Subway.